Use a stand mixer, starting with the liquids first and the yeast at the end. Do not stir more than 5 minutes. Add the sifted flour as needed if the dough is sticky. Allow the dough to rise and double in volume then spread on the greased and floured pizza tray. Blanch 10 large tomatoes without peel. Add 1 onion, finely chopped, 4 garlic cloves, finely chopped, 1 tsp. sugar, 1 1/2 tsp. oregano, a pinch of salt, 1 tsp. basil, cayenne pepper and tabasco to taste. Let reduce on low heat. If too liquid, add a can of tomato paste. Once the pizza is garnished, let it stand for at least an hour before cooking to allow the dough to rise a little. Start by spreading the sauce, then add cheese, vegetables and bacon. Bake for about 12 to 15 minutes at 450 °F. 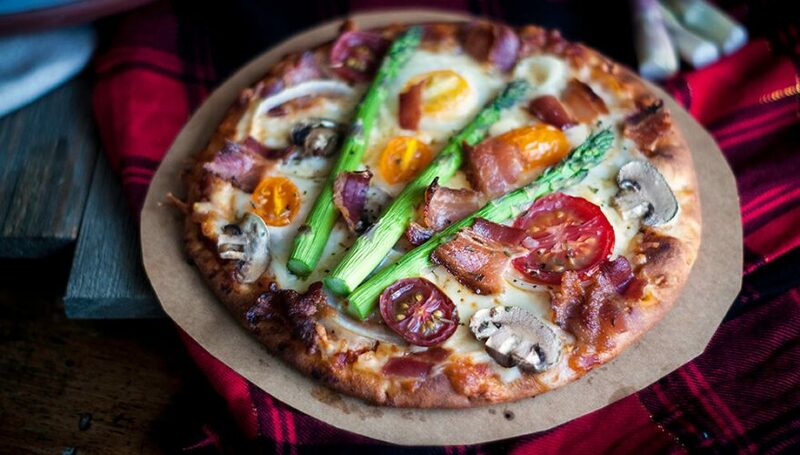 * Note that it is possible to prepare the dough and place it in the refrigerator one night before preparing the pizza. Just place it in a bowl, large enough to allow it to rise. The next day, take out the dough, spread it out, garnish it, and let it rise a little longer on the counter before cooking.